It’s the start of winter in Sydney. A lovely time of the year, cold and clear, with blue skies and bright sunshine! A ex-pat friend, Amanda M, is visiting from Cleveland, Ohio. She remarked that it was “Fall” weather for her! I guess we are lucky in Australia to have relatively mild winters. 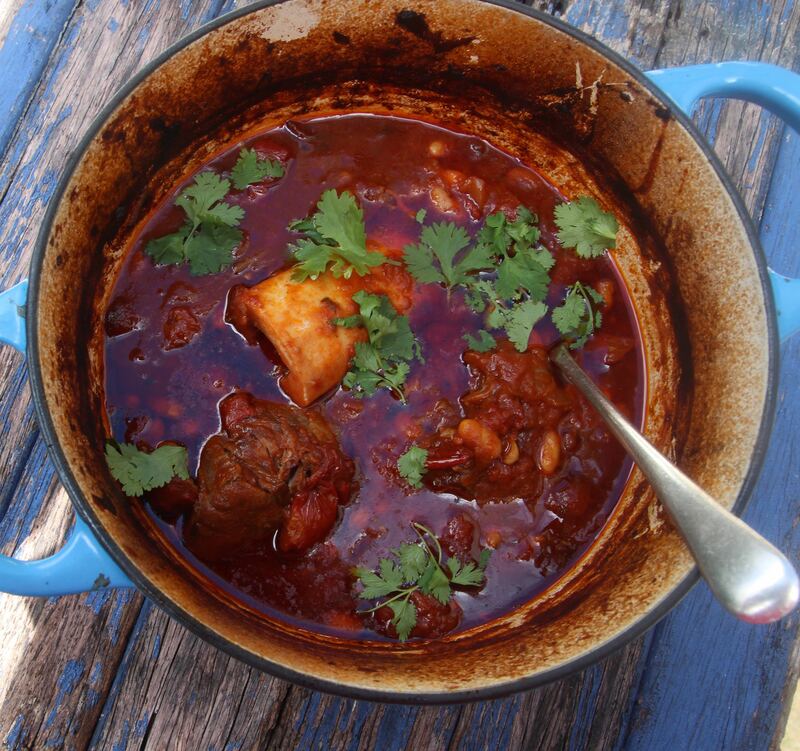 I’m posting this 2014 recipe again, to remind myself that it’s time time to get out the Le Creuset casserole and start making some lovely slow cooked beef dishes! This recipe hails from MoVida Bar de Tapas, restaurants in Melbourne and Sydney, from the cookbook MoVida: Spanish Culinary Adventures. I cooked the beef cheeks in the oven rather than on the stove top as the original recipe suggests. The temperature needs to be low and the cooking time long. This is slow cooking at its best! Preheat the oven to 140 degrees C or even lower if your oven is hot (like mine). Trim the beef cheeks to neaten them up and remove any sinew and silver skin. Season well. Heat half the olive oil in a large heavy-based baking dish over high heat. Brown the beef cheeks for 2 minutes on each side, or until golden, then remove from the pan. Add the remaining olive oil, then add the carrot, garlic and onion and sauté over high heat for 12-15 minutes, or until well browned. Stir in the sherry, wine, bay leaves, thyme, sea salt and 500 ml water. Reduce the heat and add the beef cheeks. Cover and place in the oven to cook for 3-4 hours, or until the cheeks are beginning to fall apart. The sauce from the beef cheeks should by now be reduced and glaze-like. If it needs further reducing, remove the cheeks from the baking dish, cover with foil to keep them warm and simmer the sauce over high heat on the stove top until nicely reduced. Gently reheat the cheeks in the sauce if necessary. I served the beef cheeks with slow baked yellow, orange and purple carrots, and grilled corn tortillas to soak up the sauce – mash or pappardelle or rice would also be good. Posted in Savoury Food, Slow Cooked Food and tagged comfort food, slow cooking movement, winter warmer. Bookmark the permalink. 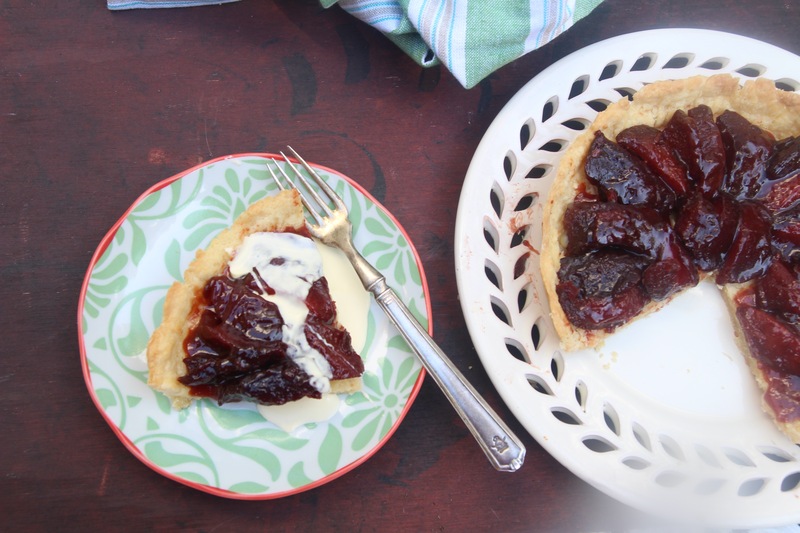 This is a really easy tart. Some short crust pastry blind baked in a flan dish and some wonderful baked quinces layered in the pastry. Serve with cream. Bliss. A few weeks ago I had a wonderful dinner with friends. Slow cooked lamb followed by tarte tatin made with quinces, which were redolent with heady spices. Cooked overnight, the quinces were a beautiful deep ruby red colour, and the cooking liquid had become quince jelly. To me, baked quinces are the epitome of gorgeous winter comfort food! My tart was not so elaborate as the tarte tatin but easy to knock up on a winter weekend afternoon, and quite delicious. This is a small flan just enough for 3 or 4 people. Preheat oven to 150 degrees C. Peel the quinces, halve lengthways and remove cores. Cut in quarters or slices. Melt butter in a heavy oven proof baking dish. Roll the quinces in the melted butter. Scatter over sugar and squeeze the lemon juice over the quince pieces. Preheat oven to 180 degrees C, 170 degrees C fan forced. Pulse the butter and flour in a food processor until it looks like coarse breadcrumbs. Add the sour cream and continue to pulse until the dough starts to incorporate into a ball. Remove from the processor and shape pastry into a ball. Wrap in cling wrap and refrigerate for 10 minutes. Roll the pastry out to 3mm thick and place in a well greased flan dish or mold, about 18cm or 7 inches in diameter. Any small mold will do. Rest for 15 minutes in the fridge. This will help reduce shrinkage when cooking. Remove from the fridge, place some pie weights or rice on the baking paper inside the tart, and bake blind in the pre-heated oven for 10-15 minutes. Remove the weights or rice and the baking paper. 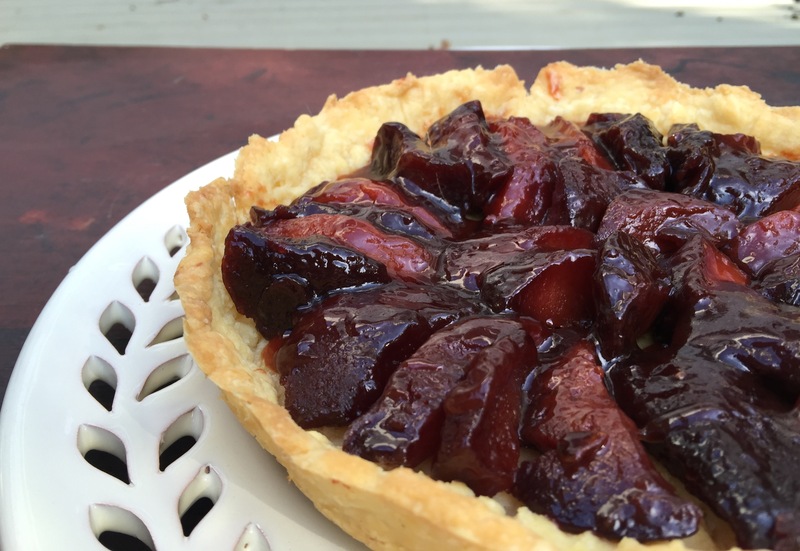 When cool, place slices of baked quince as elegantly or as rustically as you please in the flan. Serve as is or with cream or creme fraiche. *This makes enough for a small flan. Doubling the quantities will give you a large pastry shell. You would need 4-5 baked quinces to fill a larger flan. 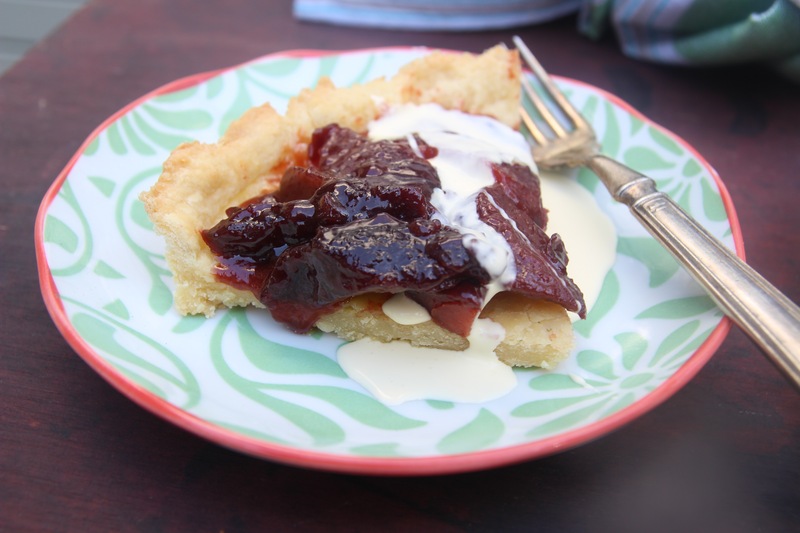 Posted in Cakes, Dessert, Pies, Tarts and Quiches, Slow Cooked Food, Sweet Food and tagged comfort food, creme fraiche, flans, short crust pastry, sour cream, tarts, winter cooking. Bookmark the permalink. 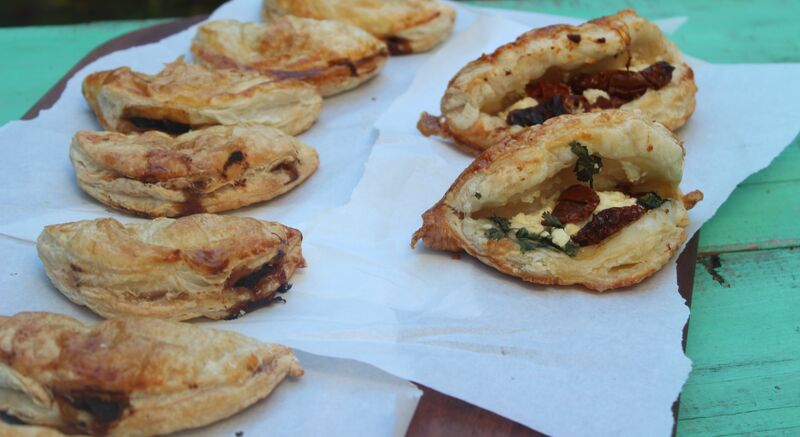 I made these pasties in 2014, and with winter almost upon us in Sydney, I am revisiting the recipes to get some inspiration for more winter cooking. The filling was some slow cooked beef cheeks, cooked in Pedro Ximinez sherry. I added in a chopped fresh tomato and and handful of chopped sundried tomatoes. 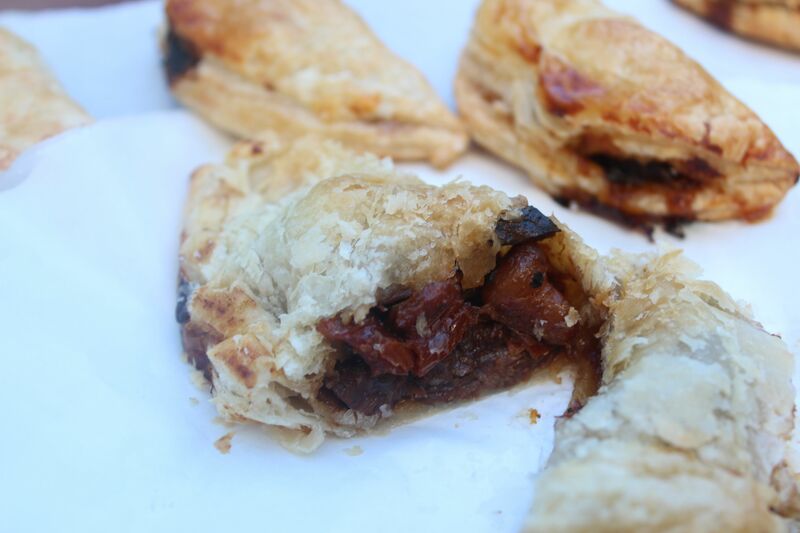 I reduced the tomatoes with the cooked beef until the mixture was thick enough to be used a pastie filling. Recipe for the beef cheeks follows. For a dozen pasties, you would need about 1/3 of the recipe quantity. The rest is great served with mashed potato or pasta, root vegetables or green salad. The sauce from the beef cheeks should by now be reduced and glaze-like. If it needs further reducing, remove the cheeks from the baking dish, cover with foil to keep them warm and simmer the sauce over high heat on the stove top until nicely reduced. Increase the oven to 190 degrees C. Take 3 puff pastry sheets, and using a plate as a template, cut out 12 20cm circles; you may have to gather up the trimmings and re-roll them to get all your circles. Don’t worry if you don’t get 12; just get as many as you can from the pastry sheets. Spoon the stew on to one half of each circle. Brush the pastry edges with water, fold the other half of the pastry over the filling to form a half-moon shape and crimp well to seal. Place the pasties on a lightly oiled baking sheet and brush the tops with beaten egg. Bake in the pre-heated oven for about 20-25 minutes, until the pastry is golden brown. Eat pasties warm or cold. Simply chopped sundried tomatoes and crumble some Persian soft feta. Add a sprinkling of fresh herbs like coriander or thyme to taste. 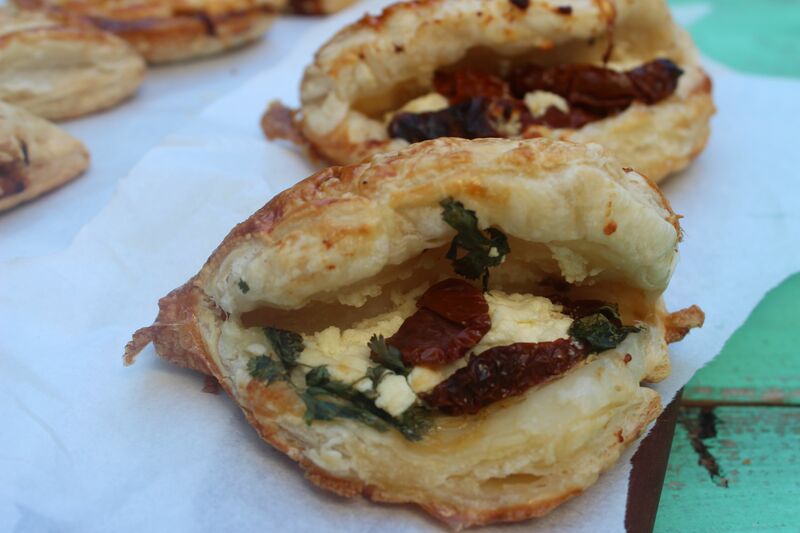 The quantities are up to you – I used 6 sundried tomatoes and 3 small pieces of feta to make 2 large pasties from 1 pastry sheet. Prepare 3 puff pastry sheets as in previous recipe. Spoon the filling on to one half of each circle. Brush the pastry edges with water, fold the other half of the pastry over the filling to form a half-moon shape and crimp to seal. These pasties may open during cooking, but as the filling isn’t liquid, they stay intact. These ones are best eaten cold. Posted in Pies, Tarts and Quiches, Savoury Food, Slow Cooked Food, Small Baked Things and tagged beeg cheeks, Madeira, Pedro Ximinez sherry, port, puff pastry, winter warmers. Bookmark the permalink. 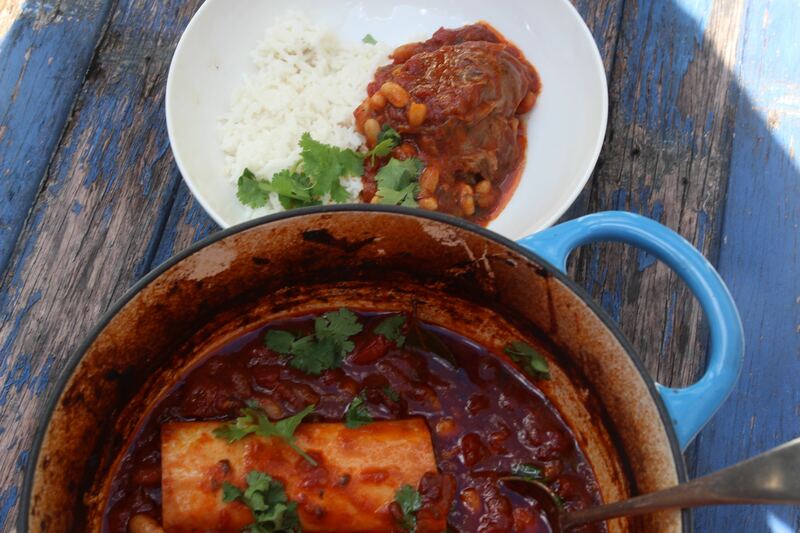 I first cooked this delicious, simple and cost-saving recipe from Jamie Oliver in 2014. The recipe has certainly been popular on my blog! I guess everyone is looking for hearty, slow cooked casseroles and stews that can be quietly cooking away for a few hours. The original post can be found here. The recipe comes from Jamie’s book Save with Jamie. I absolutely love it because it’s cooked with beef shin, bone in! 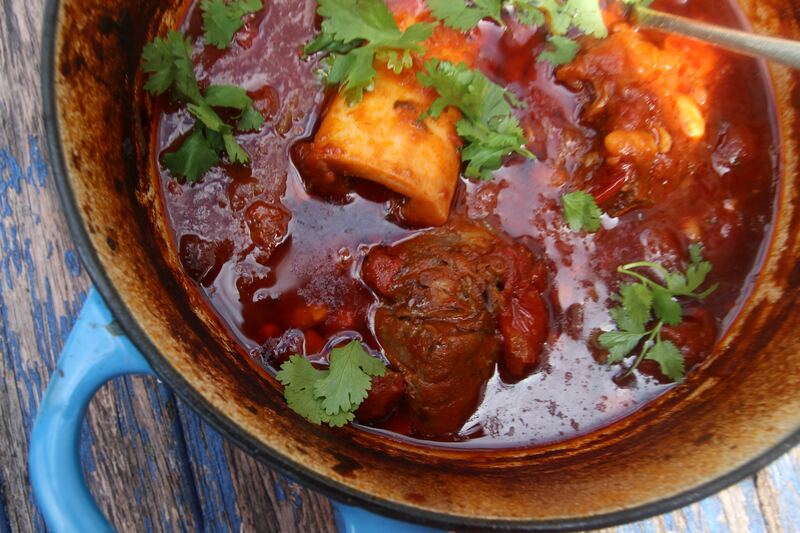 Beef shin is so rich in flavour and gets better and better the longer you cook it. The recipe needs to be cooked for a long time – 5 hours – and you end up with a lovely, unctous stew with plenty of liquid. The meat just falls apart, it is so tender. So here is Jamie’s recipe. Heat a large heavy bottomed casserole on the stove top on a medium heat. Add swig of olive oil to the pan. Add chopped red onions and minced garlic and fry for a couple of minutes. Add chopped chillis and the roots and stalks of the coriander, leaving the tops for the garnish. Add the spices and a good grind of salt and pepper. Fry till the mixture is caramelized and gnarly, but not burnt. Place the lid on the casserole and move to the pre-heated oven. Cook for 5 hours. I suggest checking after a couple of hours, and then each hour, to make sure the liquid is not drying up. Top up with water, to loosen if needed. 20 minutes before the end, drain the tin of cannellini beans and stir through. 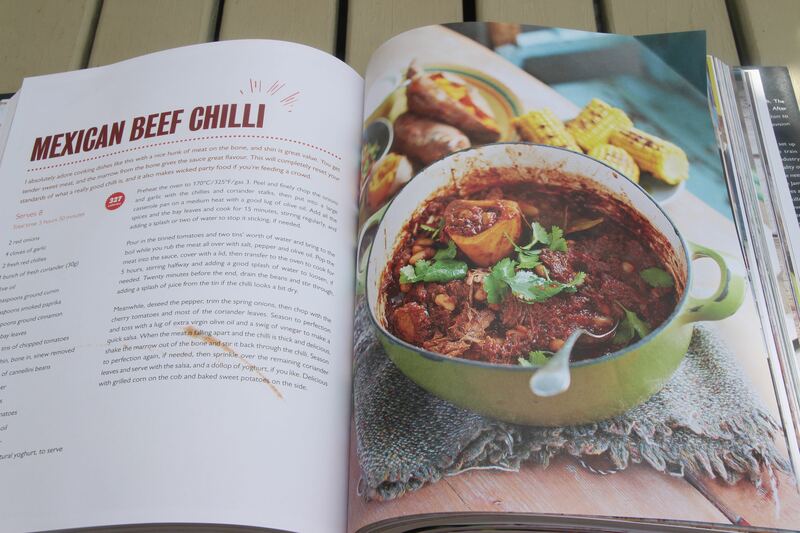 Add a splash of the bean juices if the chilli looks dry. When the meat is falling apart and the chilli is thick, shake the marrow out of the bone and stir it back into the chilli. Serve the Mexican chilli with fluffy rice and yoghurt or sour cream, and coriander leaves to garnish. Posted in Jamie Oliver, Savoury Food, Slow Cooked Food and tagged casserole, Jamie Oliver, Mexican, Save with Jamie, shin beef, stew. Bookmark the permalink.